Southland's music communities say farewell to the much-loved and respected venue Pehrspace at 325 Glendale, which will be demolished on August 4th. The venue is hosting a 36-hour Pehrathon to go on all through Saturday and Sunday as a final effort to raise funds for relocation. The farewell celebration features many long-time musicians connected with the venue, with concert blocks curated by Michael Vidal, KChung Radio, L.A. Takedown, Slow Rose, The International Adventure Club, Fourth Fridays with Mary & Eli, and Young Lovers—over 20 artists are slated to perform. 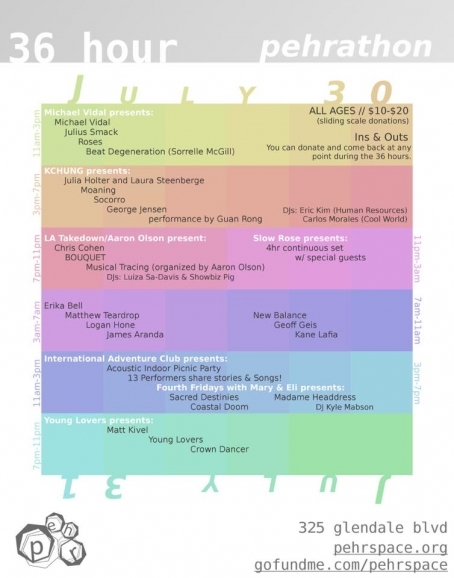 In a panel discussion last week with organizers of DIY venues The Smell, Pacific Nature, and Bridgetown, Pehrspace manager Pauline Lay lightly mentioned the prospect of attaining non-profit status as Pehrspace searches for its next brick-and-mortar location to call home. 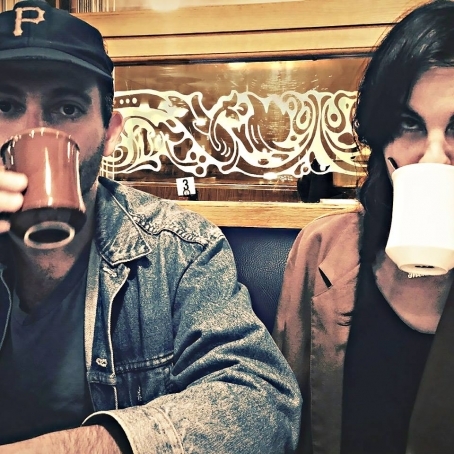 In the month leading up to its imminent closure, the music and arts space has hosted benefit concerts and an auction and moving sale to help with costs for relocation. Artpunk tenants TrapsPs even opened up their last practice to friends and fans earlier in the week at Pehrspace. In its ten years of existence, Pehrspace has fully supported creative expression and become a powerful hub for DIY music, art, film and more. Sliding scale donations will be in place for this last event ($10-$20); consider further donating to Pehrspace's GoFundMe for its relocation and continued existence. We´re excited to share the news up the 4th Annual 20th Street Block Party in San Francisco! 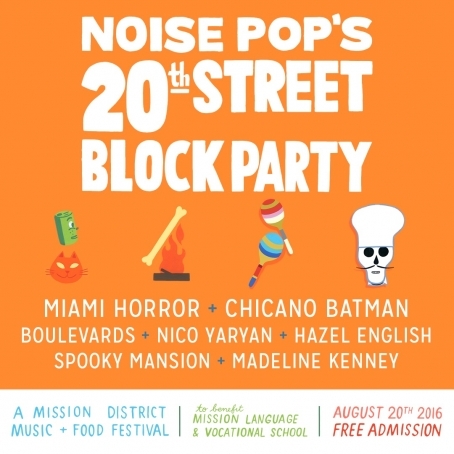 Noise Pop is excited to announce the music lineup for the fourth annual 20th Street Block Party taking place Saturday, August 20 from noon to 6:00 p.m. The event will take place on 20th Street between Harrison and Bryant streets in the Mission district; however, this year the party has expanded to include 19th Street, also between Harrison and Bryant. The free neighborhood celebration of music, food and drink, and art just outside the doors of Noise Pop HQ will bring some of the community’s best sights, sounds and flavors to thousands of guests throughout the afternoon. For more information on the event, please visit http://www.20thstreetblockparty.com. Event artwork was done by renowned artist Jason Jagel.